What is the Unconscious or Subconscious Mind We talk of in NLP? In NLP we work with the Unconscious or Subconscious Mind rather than the conscious mind but what is it really? The conscious mind is where we do all the planning and reasoning. Where we logically think things through. The elephant represents the Unconscious or Subconscious Mind. 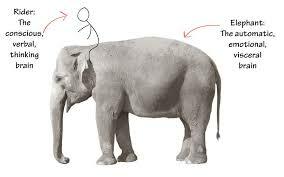 In comparison to the rider the elephant is a lot bigger and also has been around for a lot longer. In the picture below this represents the rider on top of the elephant. “Perched atop the Elephant, the Rider holds the reins and seems to be the leader. 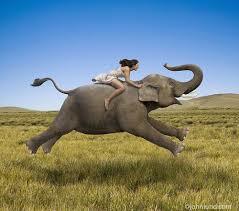 But the Rider’s control is precarious because the Rider is so small relative to the Elephant. Anytime the six-ton Elephant and the Rider disagree about which direction to go, the Rider is going to lose. He’s completely overmatched.” You need to create a path that makes it easier to be successful. 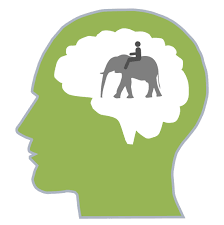 The Unconscious or Subconscious Mind /brain or The elephant is responsible for hundreds of years of automatic responses we carry out every second outside of our conscious awareness (our thoughts, actions and default behaviours). It includes emotions, gut feelings, visceral responses and responds to stimulus control whether the response pairing are innate (like the startle response) or learned (like the urge to answer the phone when it rings). The elephant is irrational and driven by emotion and instinct. The rider has very little influence on behaviour. Although he can look into the future and imagine hypothetical scenarios and make plans he cannot order the elephant to do anything. Essential the rider is merely an adviser. Often the rider thinks that they are in charge or perhaps don’t even notice that there is a great big elephant. Then give themselves a hard time when they are unable to stick to things or don’t get the results that they want. Issues occur when the rider and the elephant are not in harmony. Or even worse are in direct competition with each other, but the elephant being the size and strength that he is will win every time. 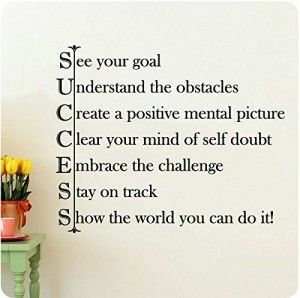 It is possible with coaching and NLP techniques to learn to train that large elephant. The rider and the elephant can learn to work in harmony. The rider can learn to listen to the elephant’s feelings, intuitions, dreams and physical symptoms to make plans and decisions.